With increasing Smartphone users, Smartphone applications and mobile payment become essential for today’s business. 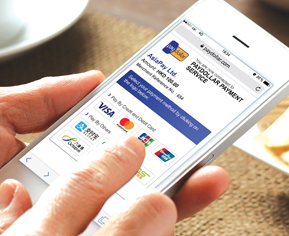 PayDollar Mobile Payment Service provides secured mobile payment platform for merchants’ Smartphone applications and mobile sales outlets. Increase sales by tapping mobile shopping market. Improves competitiveness. Start selling on Smartphone before your competitors. Open up a convenient mobile sales channel for customers to make purchase at anytime anywhere. Provide convenient shopping experience to your customers. Adapt to market trend by providing mobile sales and mobile payment channel in Smartphone device. Improves brand image with advanced mobile application interface and payment function.